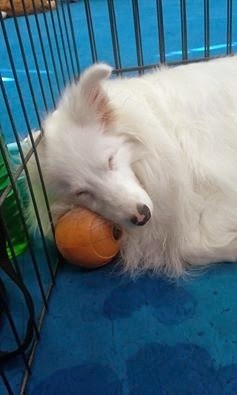 White Dog Blog: October is slipping away! The month of October is slipping away! It's almost half over already and I have not written a blog post. Wow. Things have been busy! Treasure and I have returned from a trip to MD for our fourth Tellington TTouch training. We both had a great time visiting with old friends and meeting new ones. There was lots of practice with touches and wraps and playgrounds! Treasure and I got to share a hotel room with our friends Mickey and Rose too! That was fun! It had been a while since we've seen them. I have now completed requirements to become an official Tellington TTouch Apprentice! I'm excited to expand my use of TTouch now as I continue to prepare for certification as a practitioner! 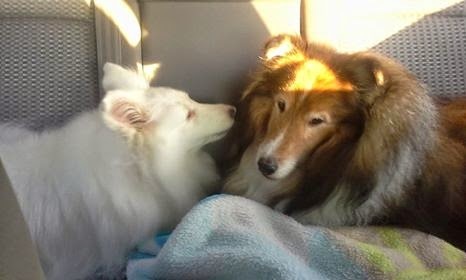 Treasure telling Mickey a secret in the car on the way to training.